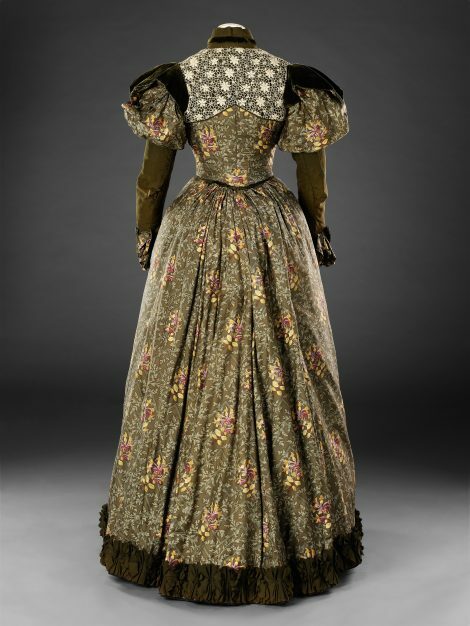 Conventional in style for its time, with a close fitting boned bodice, defined yoke, tight sleeves with epaulettes and full puffed top sections, this two piece dress nevertheless shows the influence of artistic dress on the materials from which it has been made. Originating from the attempts to reform ugly aspects of women’s clothing, artistic dress favoured muted colours and softly textured fabrics, and by the 1890s some of these preferences had found their way into more mainstream fashion worn by middle class women with cultural interests. 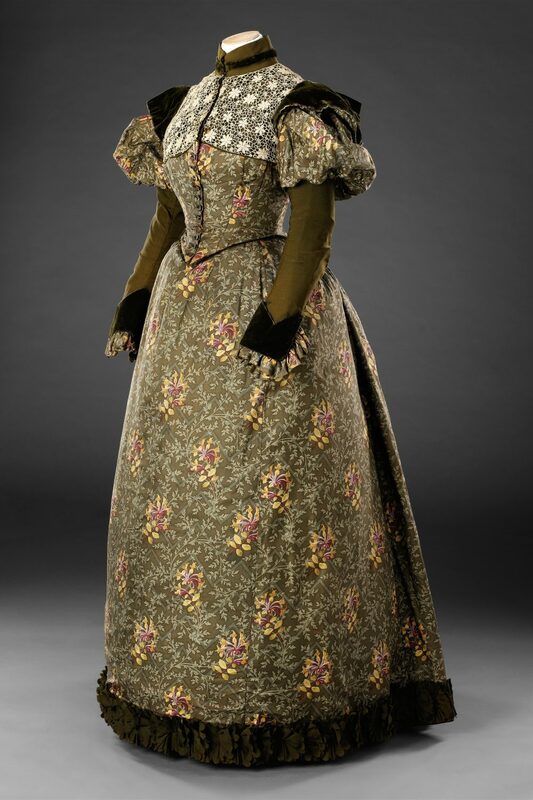 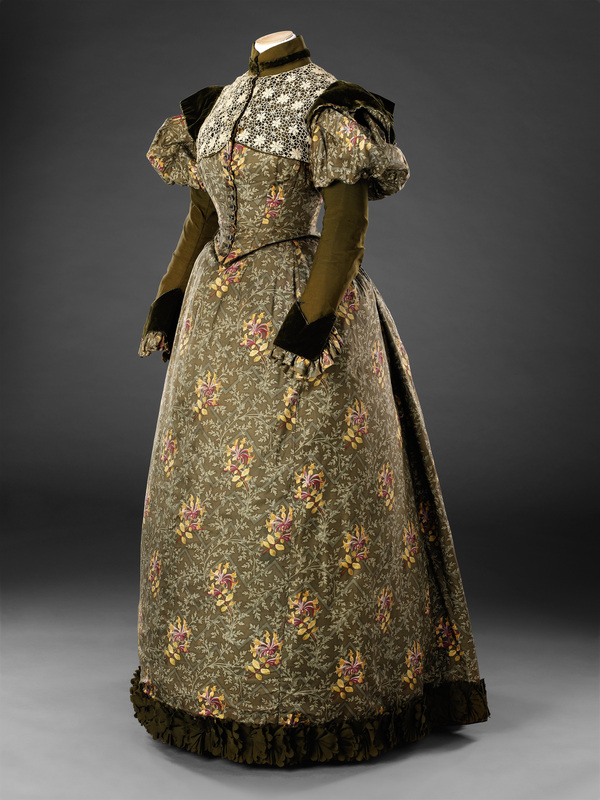 The fine silk twill of the dress’s body, the velvet and soft wool of its sleeves, collar and hem, and the ‘antique’ lace of its yoke were all favoured components of artistic dress, as were its simple grey shell buttons that celebrated the unpretentious beauty of natural materials. 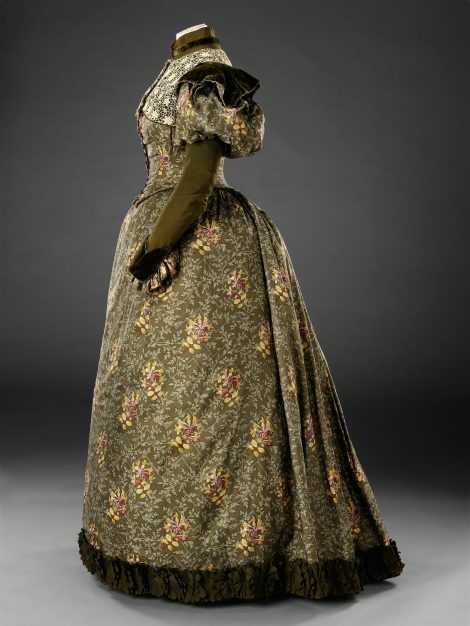 Sludgy shades of green such as olive and sage were a reaction against the brashness of synthetic dyes, and both greens have been used in the silk’s printed design of ‘faded’ pink and yellow honeysuckle with light sage foliage on a dark olive ground. 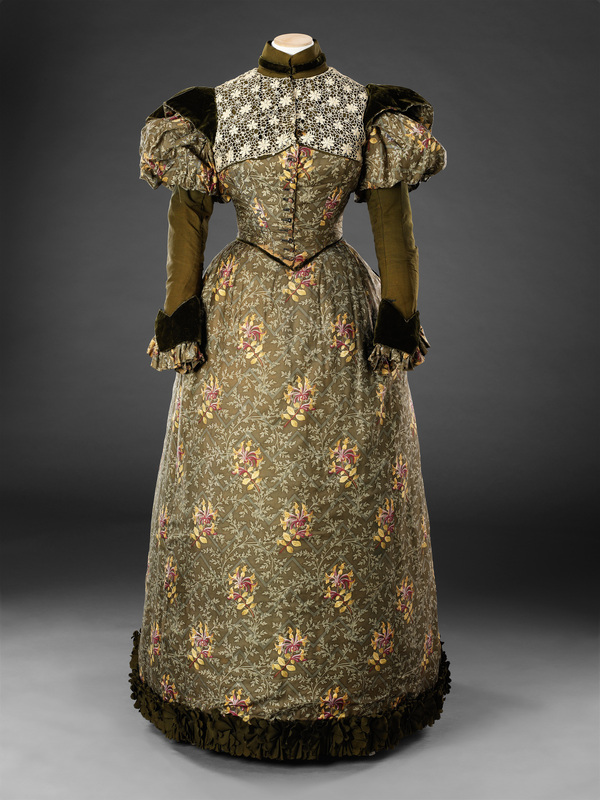 This design, albeit on a different scale, evokes some of the textiles and wallpapers produced by the firm of Morris & Co, set up by William Morris to provide items of interior design that accorded with his artistic and socialist principles. One such example is the block printed cotton ‘Honeysuckle’ of 1876, depicting pale flowers and foliage on a dark ground (https://collections.vam.ac.uk/item/O166217/honeysuckle-furnishing-fabric-morris-william/).